The Neoss® Implant System offers simplicity and flexibility. Whether it is at the time of surgery, impression taking or when restoring, the Neoss® System utilizes just One screwdriver across all implant diameter and standard restorative components. This simple One connection philosophy simplifies use, communication among the dental team and reduces complications and complexity. Yet by offering different materials for every restorative option, the Neoss Implant System delivers design control with total flexibility. Mechanical integrity of all the components that make up a complete implant pillar is key to successful long-term tooth replacement. Neoss® offers some of the highest levels of machining tolerance and quality of components available today. Single Tooth and Multi-Unit - With a complete range of abutments, Neoss® offers flexible solutions for single and multiple-unit restorations in Zirconia, Titanium, Gold or Cobalt Chrome. Cement- and screw-retained - Flexible solutions for either custom designed or angled abutments allows for a choice of either screw- or cement-retained solutions. Full Arch / Fully Edentulous - Neoss® offers solutions for both fixed and removable full arch restorations. For fixed restorations the Neoss® 4+ concept, with the patented Access abutment, offers an affordable and logical solution. 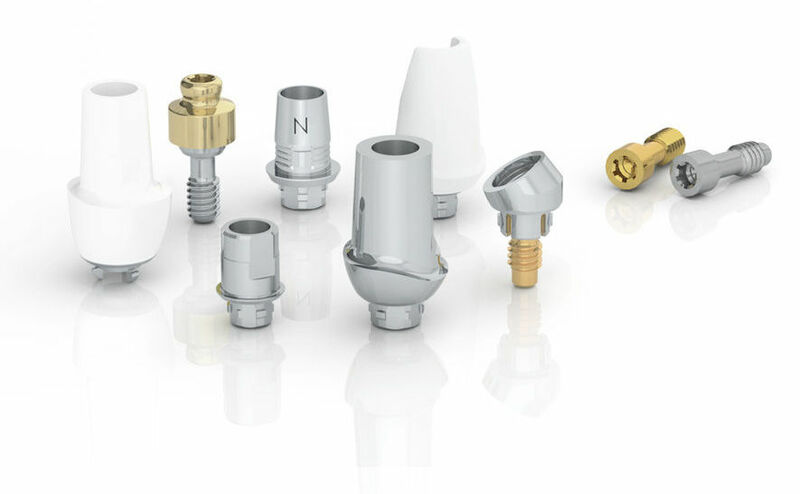 For removable prosthesis Neoss® offers a product range of Equator, Ball or Bar abutments. Having the ability to work at either implant level or abutment level gives total flexibility and control to the restorative dentist. Neoss® offers implant-supported bars, bridges and Individual abutments, which, in addition to the proven Neoss® implant system, are compatible with implants of other manufacturers. Esthetiline - The Neoss Esthetiline solution provides seamless restorative integration from implant placement to final crown restoration. A natural emergence profile may be developed during healing and then matched perfectly in provisional and permanent restorative components. Instrumentation and trays - User-friendly kits, coupled with a minimal amount of instrumentation creates the benefits of reduced investment and inventory. The Neoss® Implant Systems offer reliable, durable and cost-effective treatments with minimal complications. The intelligent simplicity ethos within Neoss strives to create products that are adaptable resulting in a rationalized inventory and procedures. 1. Warranty data up to 2013 on file. 2. Fatigue Performance according to ISO 14801, Neoss Sponsored Report.